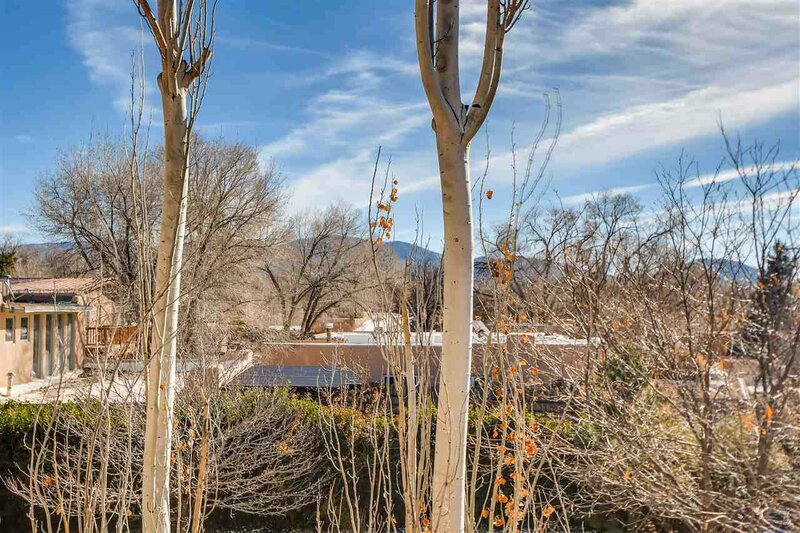 In the heart of downtown and less than a mile from the Santa Fe Plaza, this elegant and private home offers a very comfortable living. This 2 bedroom, 2 bathroom beauty that was built in 2005 with the highest quality custom finishes include: solid wood cabinets and doors, granite countertops, plaster walls throughout, vigas in all the rooms, designer tile in bathrooms, skylights, kiva fireplace in living room, gas fireplace in master suite, in-floor radiant heating and 3 minisplits units for air conditioning. Downstairs are the main living areas and guest bedroom with a full bathroom. Upstairs, the master suite that opens to an inviting deck with a view. The entry courtyard / patio is beautifully landscaped and irrigated. Although a condo of two units, this is a stand alone home with no walls adjoining another property.